In May 2017, I watched a Facebook Live session in which Harry Soo of Slap Yo’ Daddy BBQ grilled a steak using shallot oil as an added flavor element. I had no idea what shallot oil was, how it was made, or how it tasted on a steak, but I wanted to find out. 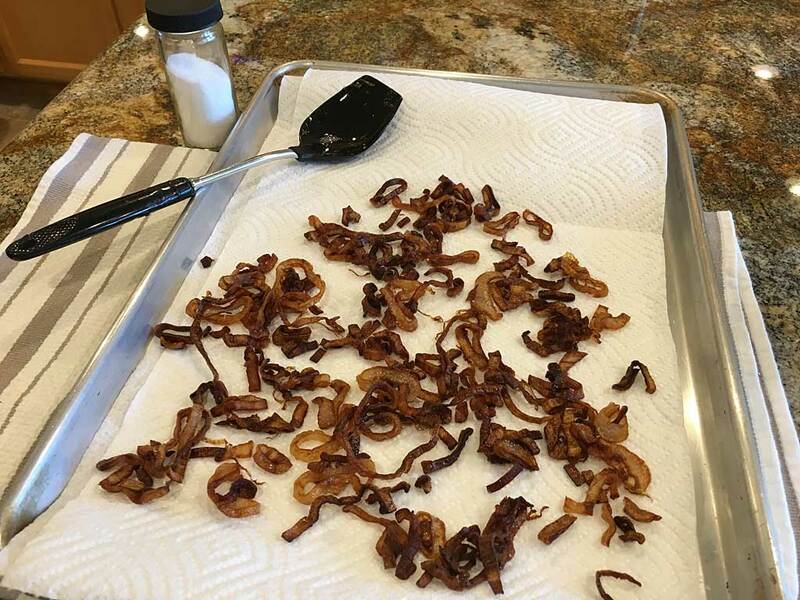 I searched the web, found several recipes for shallot oil, and picked one from New York Times Cooking that looked easy. 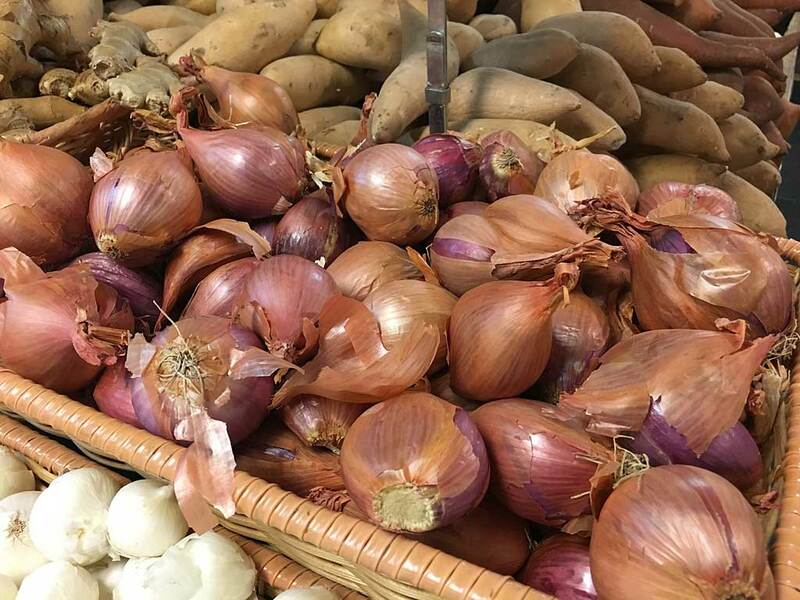 I went to the supermarket and bought 1/2 pound of shallots, which ended up being two shallots. No clue whether they were Asian or European, but I suspect the latter. 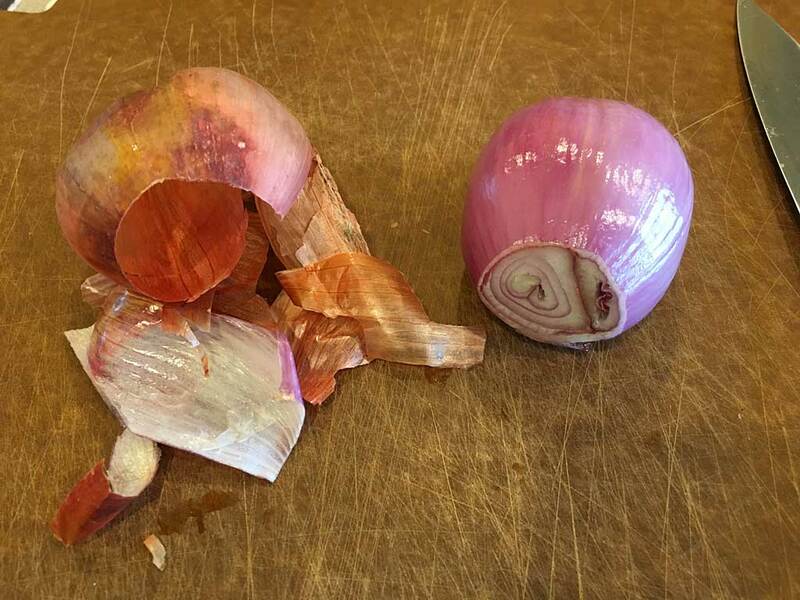 Having never cooked with shallots before, I had no idea they would be as big as they were; I was expecting something smaller like a head of garlic. 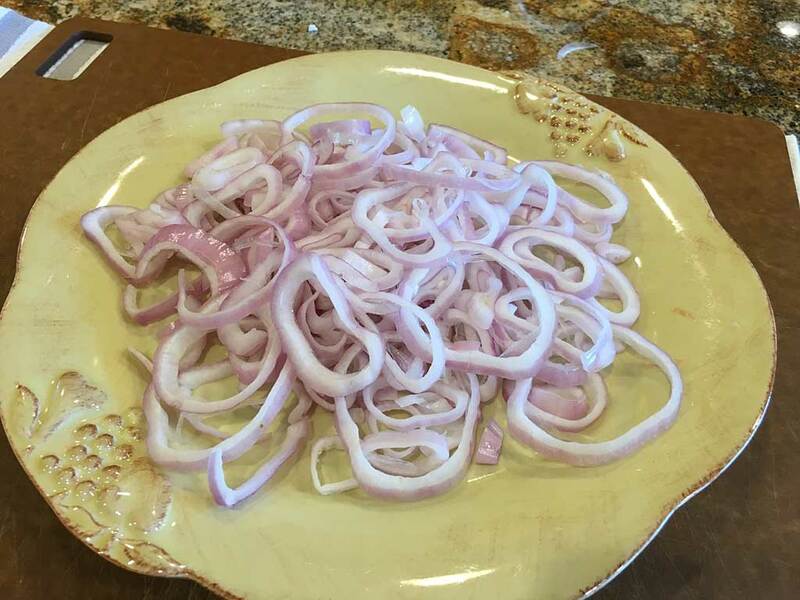 Got the shallots home, cut off each end, and found two or three segments inside—normal for shallots, as it turns out. I removed the papery outer layer, ran them through the thin setting on a mandoline, and separated them into rings. 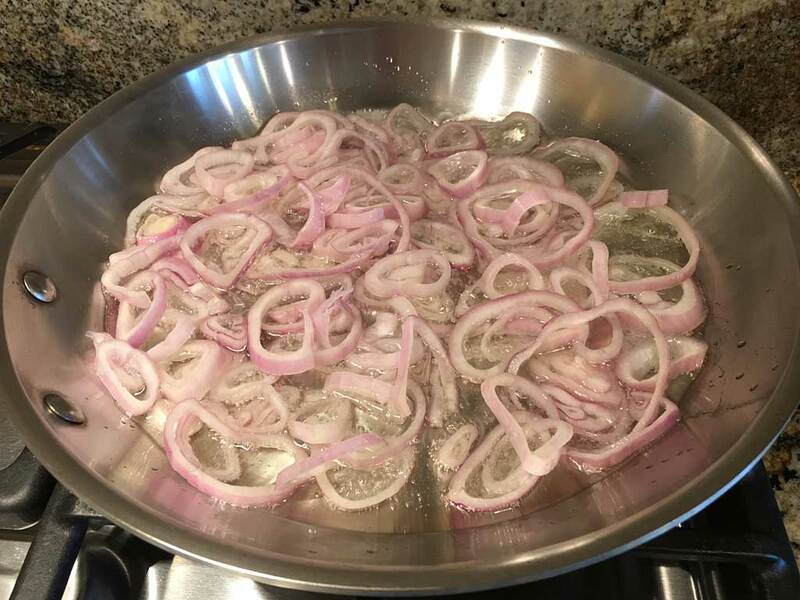 I placed the oil in a large skillet over medium-high heat, testing the oil with a small piece of shallot. 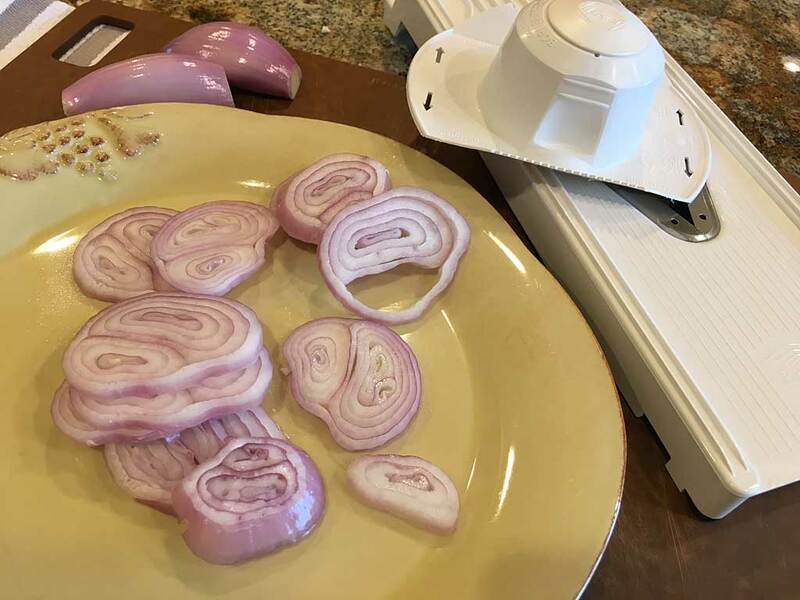 When it sizzled, I carefully added the rest of the sliced shallots and turned the heat down to medium. 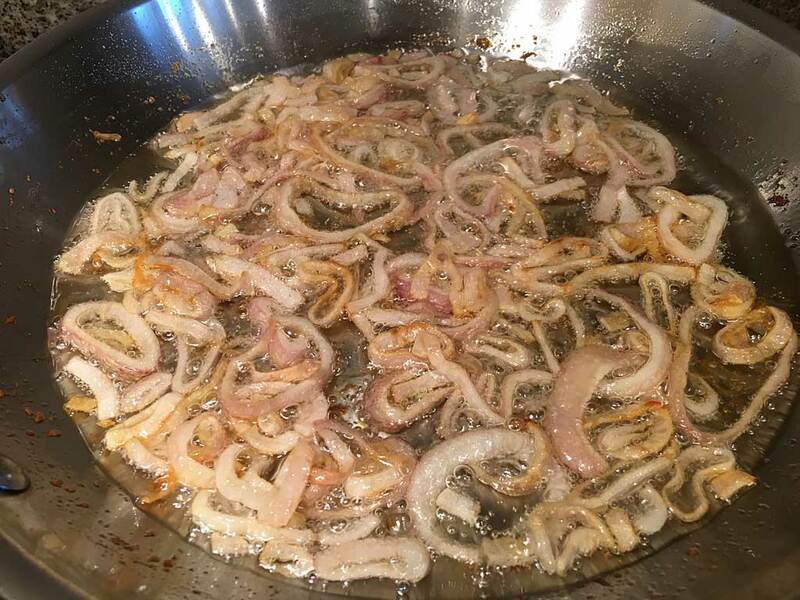 The shallots should fry at a moderate pace, not vigorously. Stir frequently. 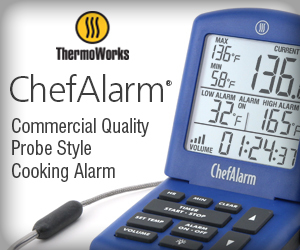 If the shallots are turning brown after 5 minutes, they’re cooking too fast—reduce the heat. After 15 minutes of frying…almost done, they brown really fast at the end! 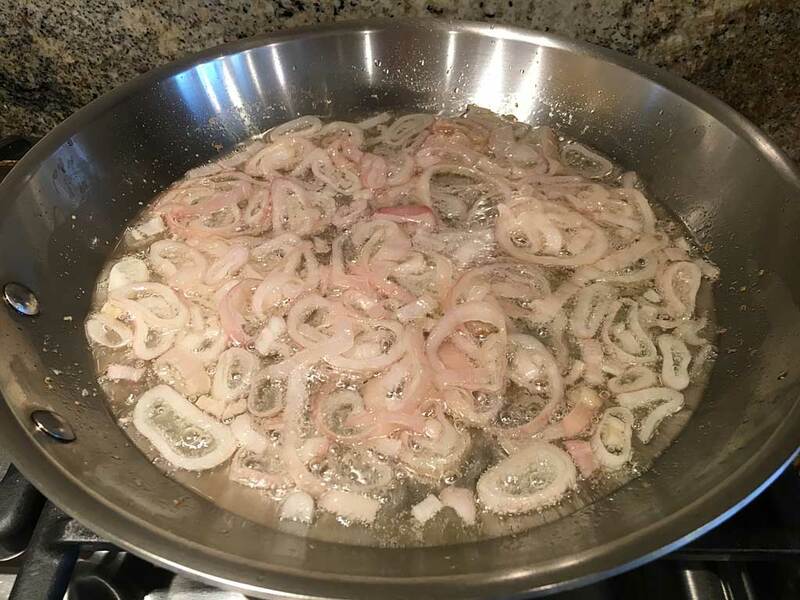 The shallots should go slowly from translucent to golden to brown and take about 15 minutes. 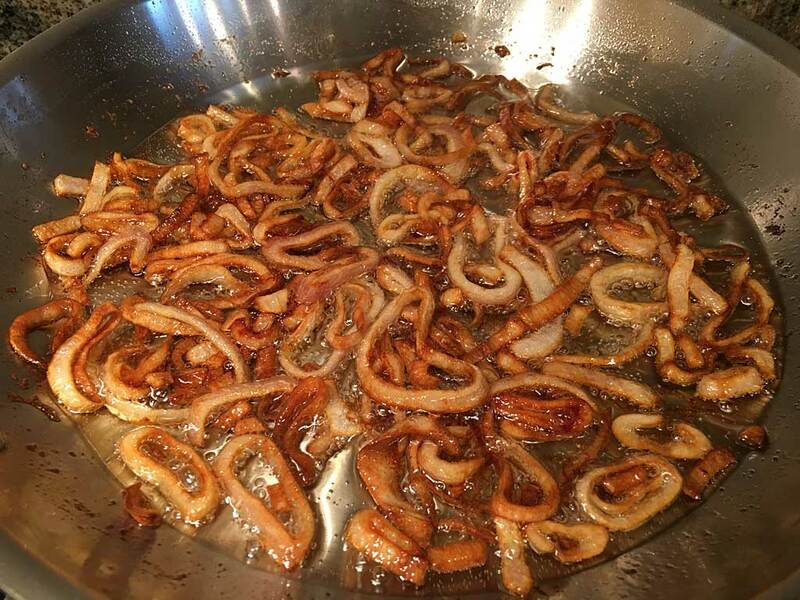 Use a slotted spoon to transfer the fried shallots to a paper towel-lined plate or sheet pan. 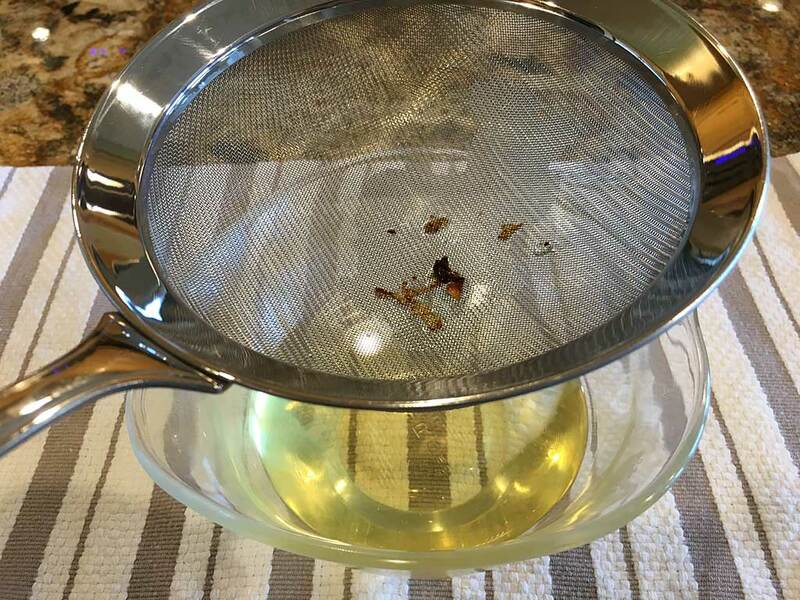 Shake off excess oil, blot with paper towels, sprinkle with a touch of salt, and let cool at room temperature for 5-10 minutes until crisp. Store these guys in an air-tight container and use in a salad, as a garnish on anything, or even as a snack. 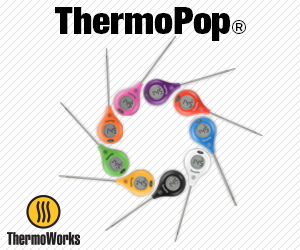 Now, turn your attention to the flavored oil. 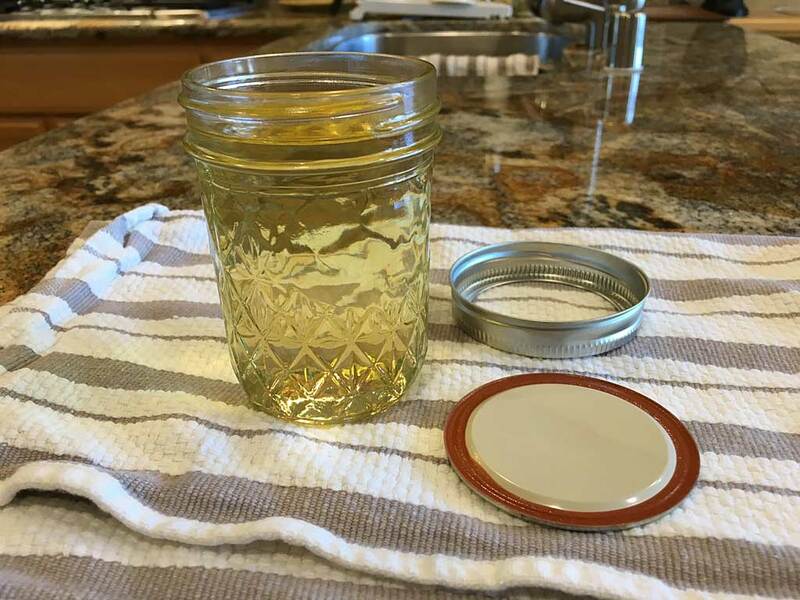 Strain the oil to remove any bits of shallot and store in a cool place or refrigerator in an airtight container. With oil now in hand, I proceeded to buy two beautiful bone-in New York strip steaks. 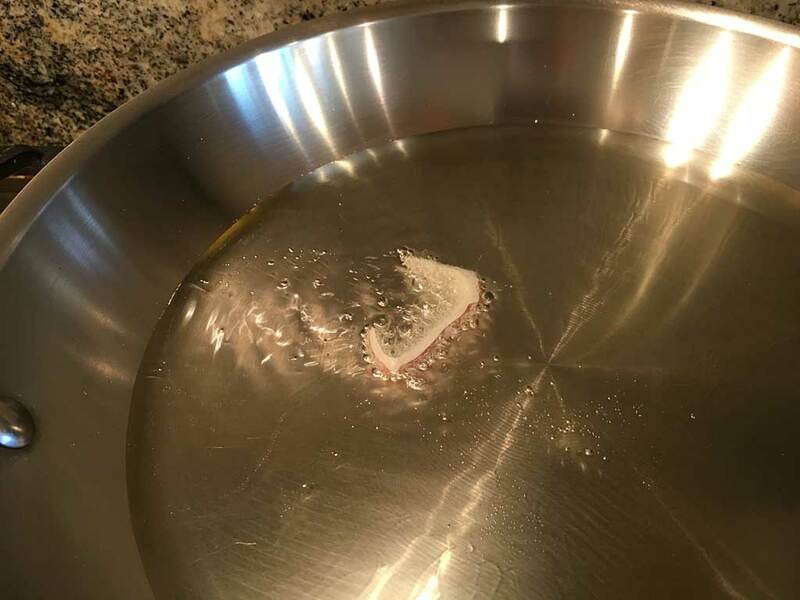 I sprinkled both sides with kosher salt and left them in the refrigerator for an hour so the salt had a chance to flow into the meat. While I preheated my Weber Summit 450 on MEDIUM, I removed the steaks from the fridge and patted both sides dry with paper towels (removing excess surface moisture after salting promotes better browning of the meat). 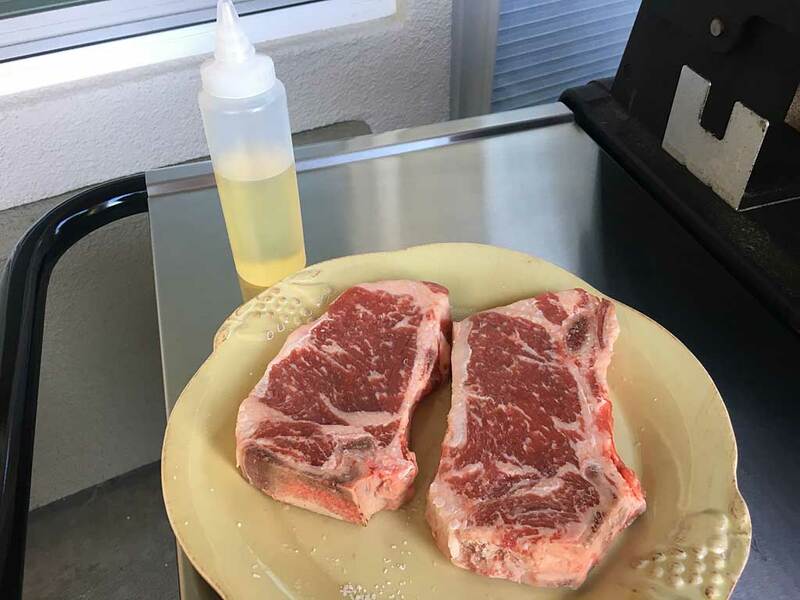 I also placed some of the room temperature shallot oil into a squirt bottle for easy application to the steaks. 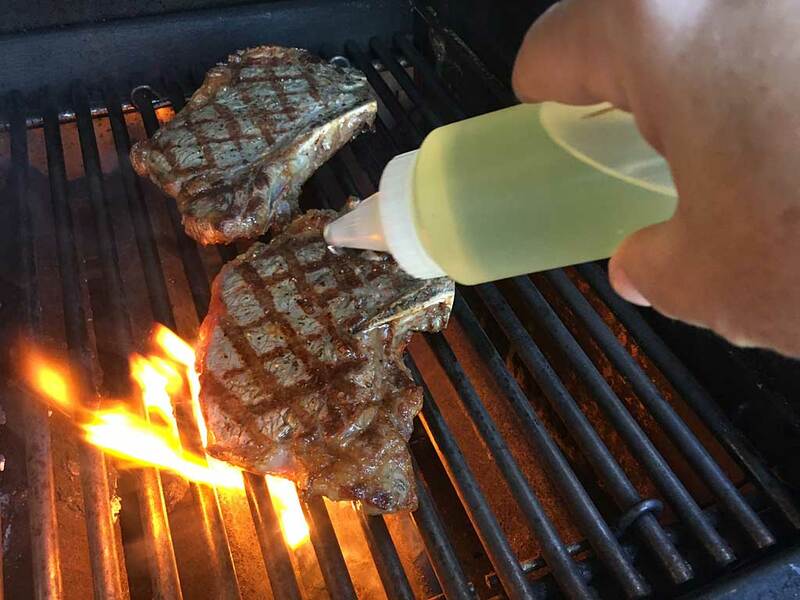 After grilling the steaks for a couple of minutes on each side, I started turning the steaks every minute and applied a shot of oil several times to each side. I cooked these steaks for about 10 minutes to an internal temp of 135°F, somewhere between medium-rare and medium doneness. The steaks were delicious and the shallot oil added a really nice flavor that my wife and I enjoyed very much. 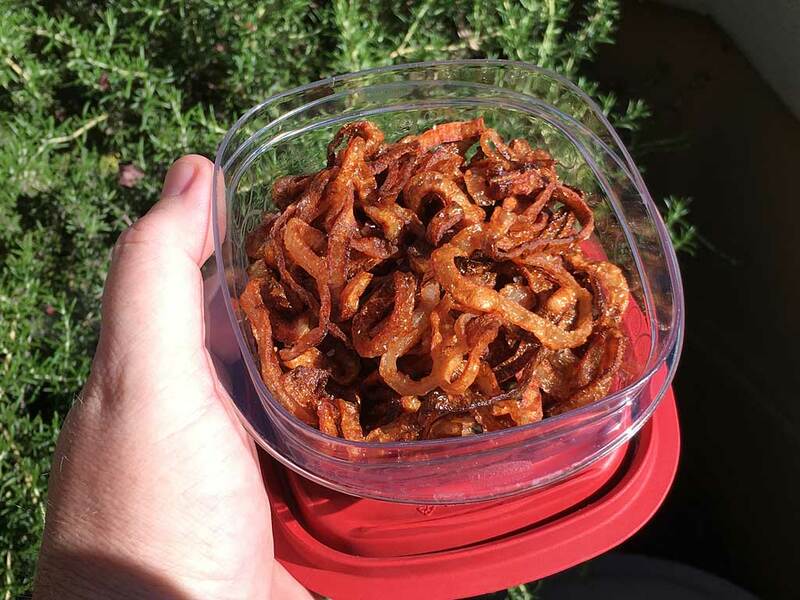 And my wife devoured those fried shallots as a tasty snack! Yes, making shallot oil takes some effort, but the results taste great. 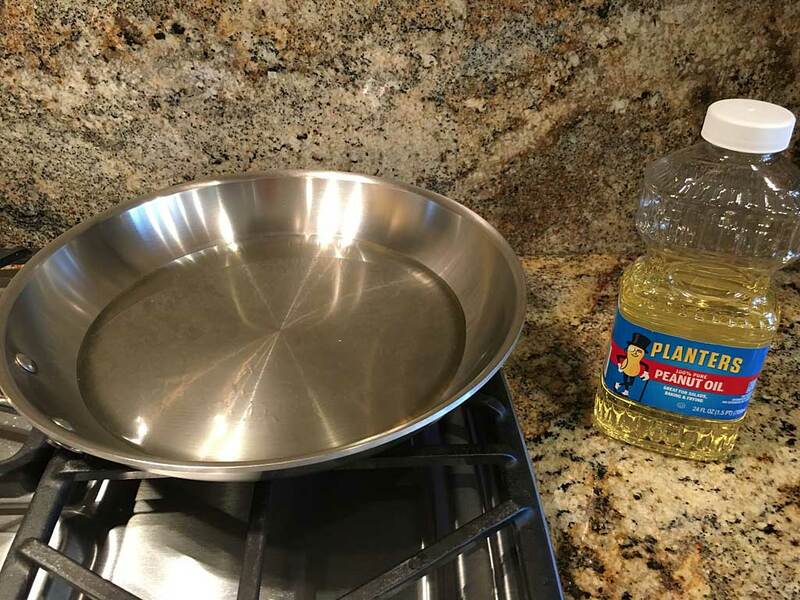 Not only can you use this oil on steaks, but also for stir-frying and for any purpose where a mild onion flavored oil would be appropriate.